Brain abscess rupturing into the lateral ventricle causing meningitis. A 52-year-old male with a past medical history of diabetes mellitus and hypertension, non-compliant with medications, presented to the emergency room complaining of gradual onset of constant headache with neck pain, stiffness and tactile fevers for two days. In addition to photophobia he notes one episode of non-bilious or bloody vomiting. The patient had a history of recent nasal congestion, dry cough and exposure to a sick contact with pneumonia. On physical exam the patient was found to be drowsy but oriented to person, place and location. His neck was supple, and lungs were clear. Vitals signs in the emergency room: temperature of 100.7 F, pulse 94 bpm, blood pressure 212/108 mmHg, respiration rate of 20 breaths per minute and oxygen saturation of 90% on room air. The remainder of the physical exam was unremarkable. Laboratory results are in Table 1. The Patient was placed on droplet isolation. Treatment for presumed meningitis was started with ceftriaxone, ampicillin, vancomycin and dexamethasone. CT scan of the brain without contrast showed no bleed, or intracranial masses [fig. 1]	. Spinal tap results revealed cloudy fluid without xanthochromia, white blood cell 22,225 [/mm3], red blood cells 250 [/mm3], glucose 124, protein 282, neutrophils 71%, monocytes 26, macrophages 3. Gram stain, bacterial antigen, cryptococcal antigen, VDRL and Indian ink were negative. 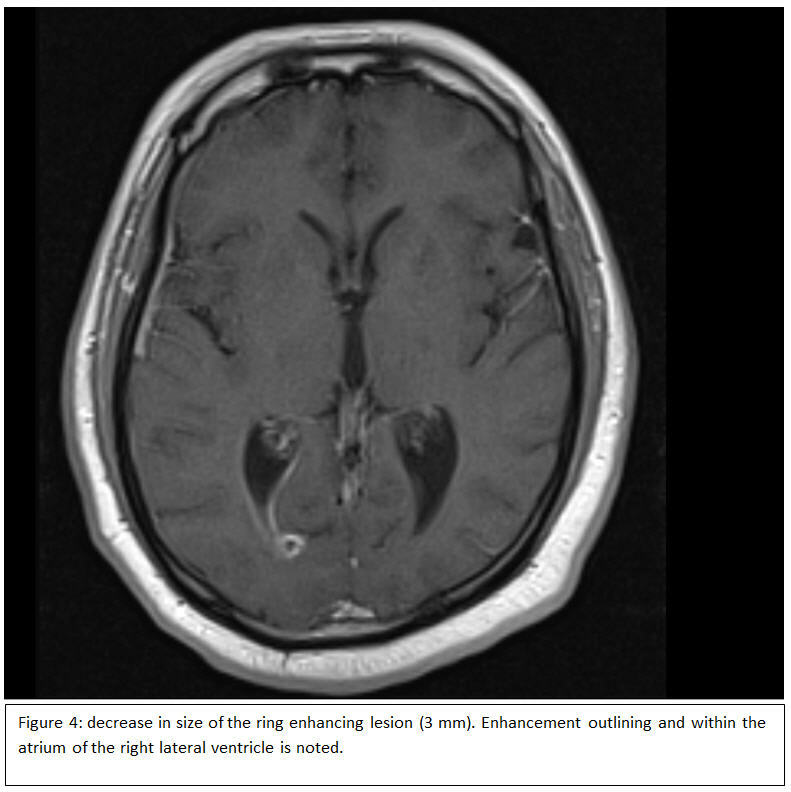 MRI of the brain with and without contrast identified a 9mm ring enhancing structure within the right occipital lobe compatible with brain abscess with direct connection to the right lateral ventricle. [fig. 2]	[fig. 3]	Metronidazole was added for treatment of brain abscess. Ampicillin was discontinued. Patient’s mental status returned to baseline 24 hours on antibiotic treatment. On day 4, results from spinal fluid tuberculosis polymerase chain reaction and viral encephalitis panel sent to NYSDOH were negative. Spinal fluid cultures were negative. One blood culture set was positive for propionibacterium acnes. Vancomycin was discontinued. 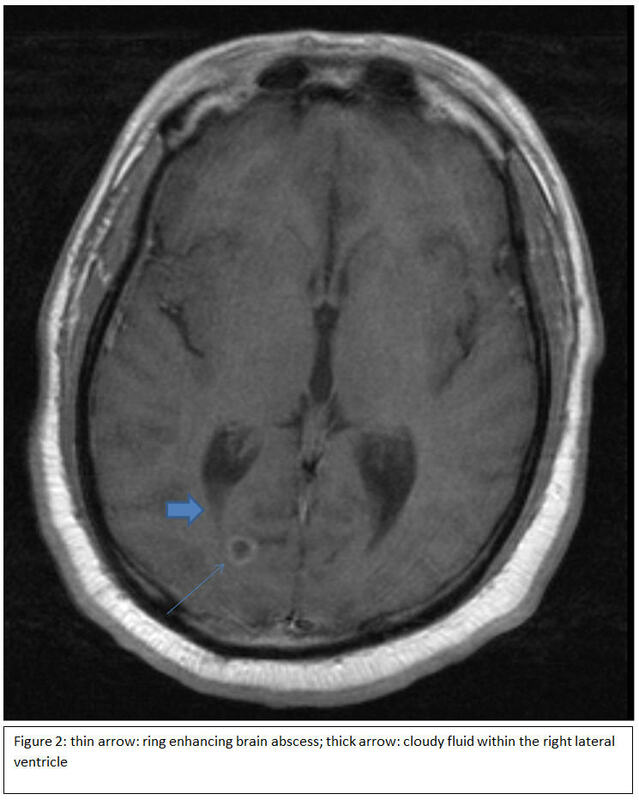 An MRI obtained six weeks into treatment showed a smaller ring enhancing lesion measuring 3 mm along with enhancement within and adjacent to the atrium of the right lateral ventricle. [fig. 4]	The patient was treated for an additional two weeks. 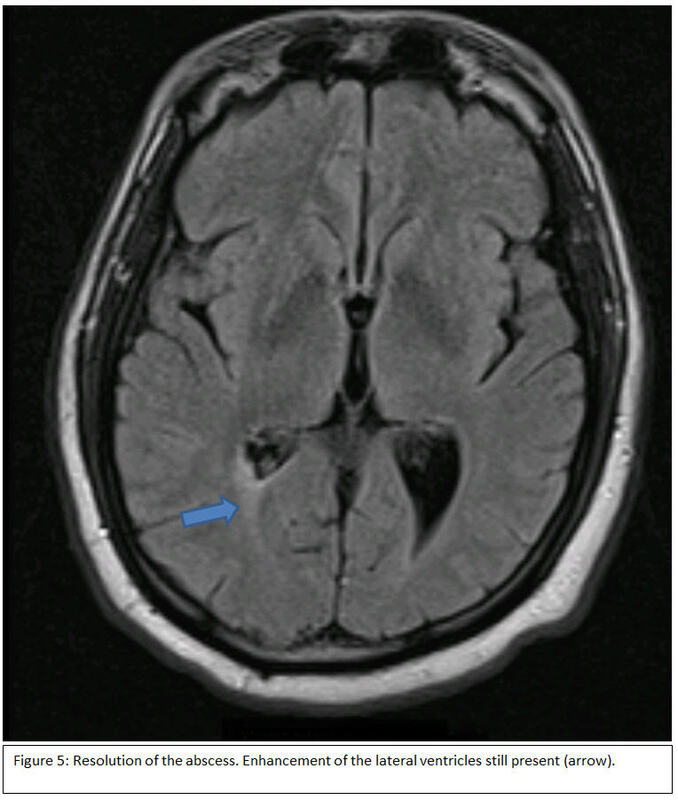 Repeat MRI after 8 weeks of treatment showed resolution of the abscess and decreased inflammation of the posterior horn of the right lateral ventricle. [fig. 5]	The patient was seen in clinic 6 weeks after therapy. He remained asymptomatic. 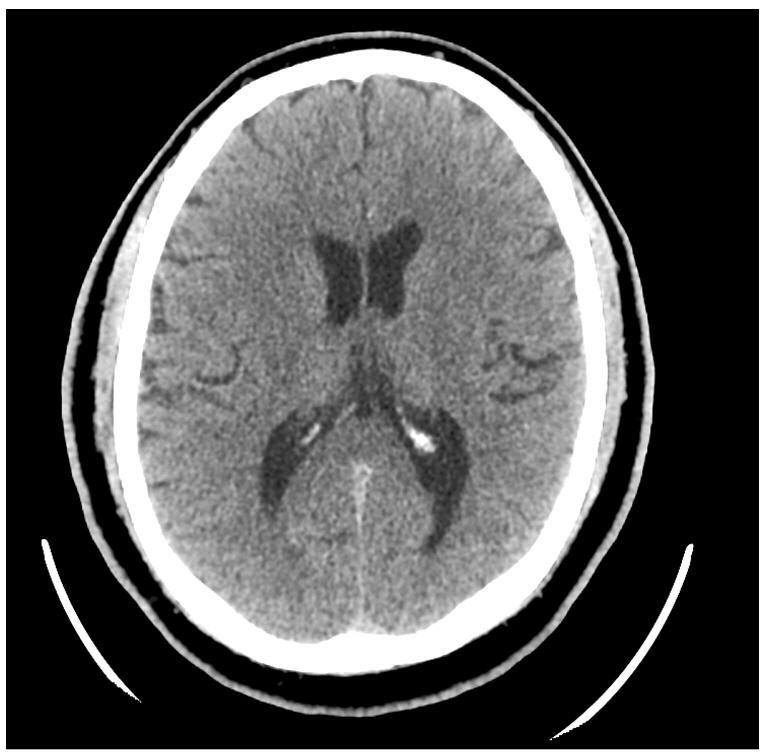 Intraventricular rupture of a brain abscess is a rare event associated with high morbidity and mortality which has improved with better brain imaging. White blood cells in the CSF after rupture can be very elevated and a clue to a ruptured brain abscess. 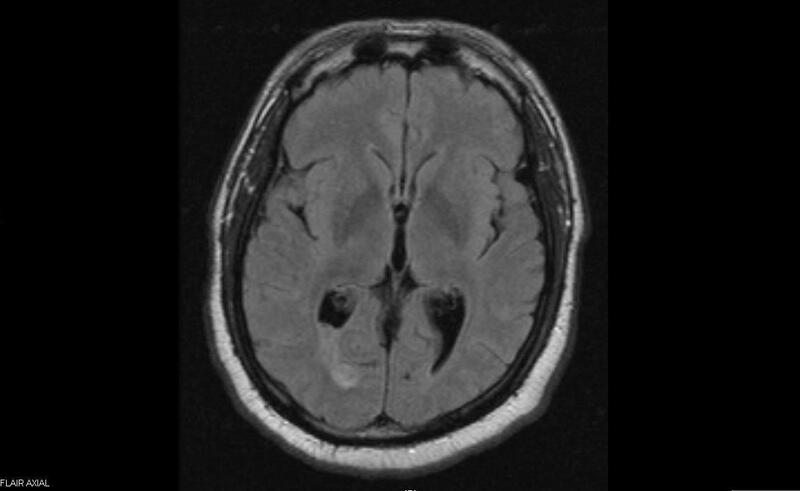 Figure 5: Follow up MRI after 8 weeks of treatment. Ferre C, Ariza J, Viladrich PF, Acebes JJ, Tubau F, Lopez L, et al. 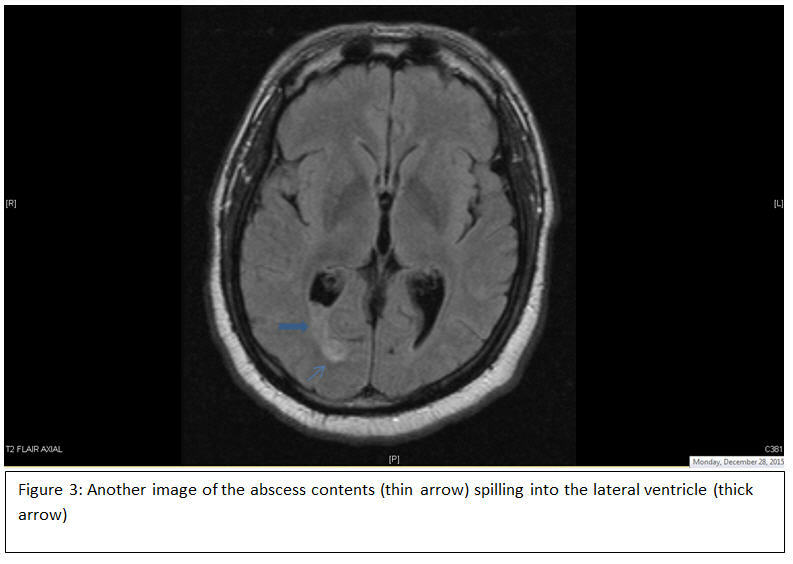 Brain Abscess Rupturing into the Ventricles or Subarachnoid Space. The American journal of medicine 1999;106:254-257. 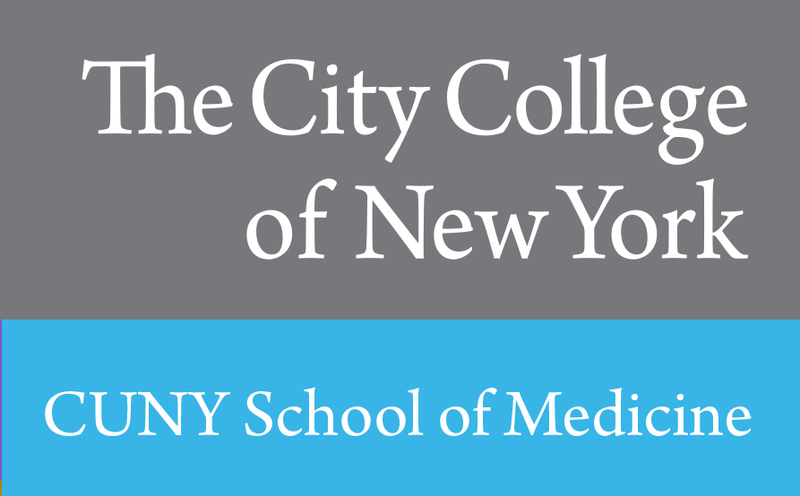 Zeidman, SM, Geisler FH, Olivi A. Intraventricular rupture of a purulent brain abscess: case report. Neurosurgery 1995;36:189-93. Mathisen GE, Johnson JP. Brain abscess. Clin Infect Dis. 1997;25:763– 81. Karma, P, Vatsal DK, Husain M, Pradhan S, Venkatesh S. MRI demonstration of unsuspected intraventricular rupture of pyogenic cerebral abscesses in patients being treated for meningitis. Neuroradiology 2002;44:114-117.